Shooting film in the city you live in or a daytrip away is one thing. What if you want to go further afield? What if you want to head to the other side of the world, or spend a few weeks on the road, and you want to bring your film gear along with you? Those of us who’ve been shooting with film since the classic days of Kodak Gold and Olympus Trips have had plenty of time to learn the dos and don’ts of shooting film on the road – but to those taking film into their carry-on for the first time, or packing their old Pentax for the first time in a while, there can be a lot to catch up on. 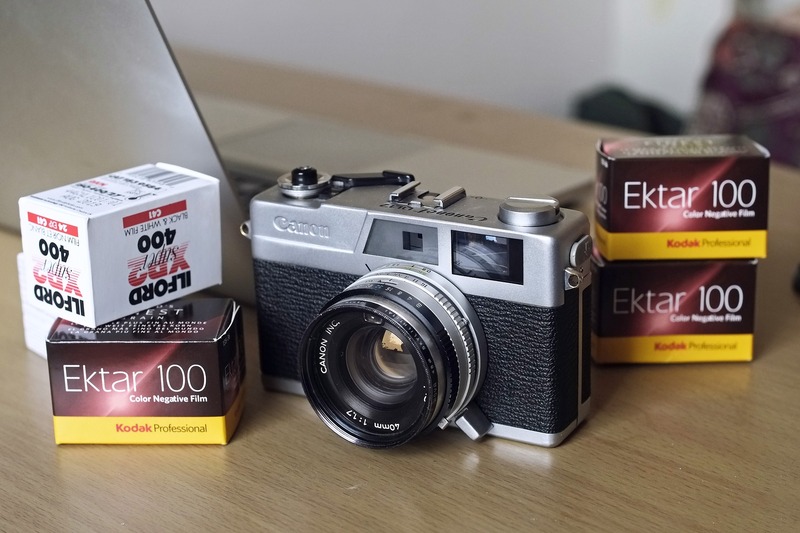 Is it better to buy film when I arrive? Can I pop my film into my hold luggage? What else do I need to take? Kosmo Foto has lugged cameras big and small and a small fortune in film from Borneo to Barcelona and Miami to Moscow, and aside from a cracked Olympus XA (still useable, however) I haven’t had any horror stories so far. Even before we start talking about what to pack into your bags, there’s Rule 1 of travelling with film: never, ever put your film in your hold luggage. All x-rays can cause fogging or destroy the film’s ability to capture detail or accurate colours. You might think that your film is going to get a more powerful dose in the carry-on luggage scanners, especially as it can receive scan after scan (some airports will scan cabin luggage as many as three or four times between bag check-in and gate). You might get lucky; those rolls of Portra 400 you mistakenly stuck in your backpack might sail through with barely a scratch. But the risks are too high. Your film and cameras gets first priority in your carry-on, aside from life-saving medicine and delicate electronics. Everything else should go in the hold luggage. Back in the 80s and 90s, those who were serious about their photography stuffed their film into lead-lined bags that protected their cherished memories from intruding x-rays. They probably helped a bit, but in an age of heightened security, all these bags are going to do is raise big question marks when they go through the scanner. The scanner operator is likely to up the dose of radiation to see what’s in that bag, and your film is therefore going to subjected to a much higher dose of radiation. And chances are you’re going to be pulled out of line to explain what it is. Modern airport scanners are film safe, at least for film up to 800 ISO. Having regularly shot Tri-X at 6400 on tour with Buffalo Tom and having that film scanned at least twice, this is a conservative safety benchmark (all of these films have been fine). No one scan by a cabin luggage scanner is going to fritz your film. What is something to consider is putting your film through as few scans as possible, even though the modern generation of hand luggage scanners you’ll encounter at most airports are very film safe. 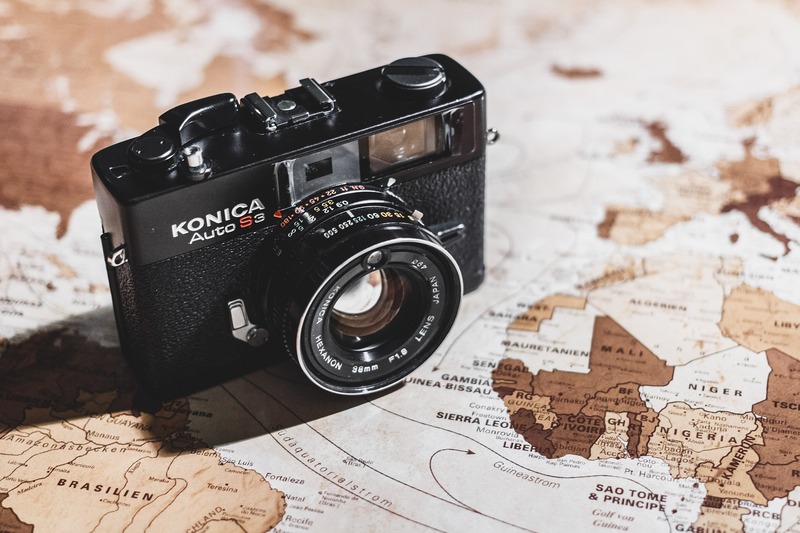 If your trip means multiple scans, then you should consider trying to get your films hand checked so that they run less risk of the possibly running cumulative effect of x-rays. A plethora of excellent blog posts on this subject have all led with personal experience – some have found film checks in Europe impossible while in the US it’s been a breeze. Some have found American customs much less flexible, while Asian airport staff much happier to help. It may, ultimately come down to such factors as how stressed the airport staff are and how busy the queue is. Take film out of its box and plastic canister and put it in a heavy-duty freezer bag (I find the Ziploc ones perfect for this). Keep a empty few canisters so you can use them day to day. Put the freezer bag of film in your cabin bag. Do this before you leave home. Seriously. 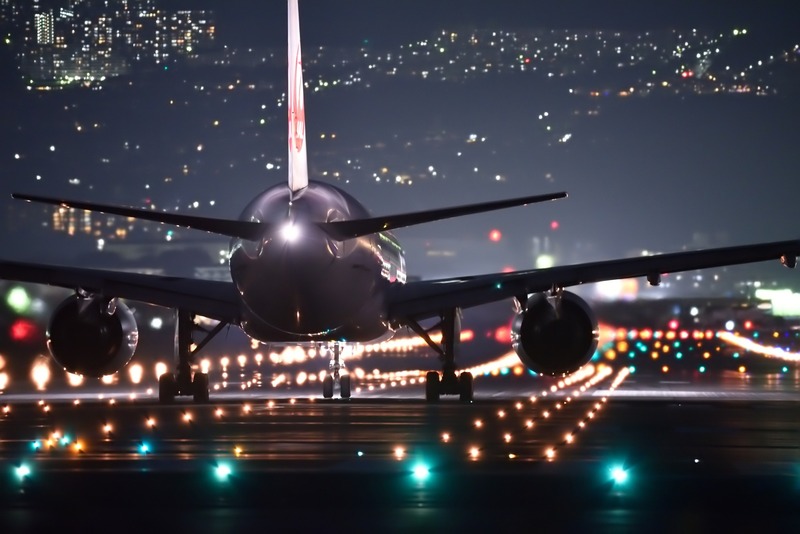 Make sure you arrive in plenty of time for your flight. Don’t be the person late for their flight who then holds up everyone else for 20 minutes to get your film checked. When it’s your turn to bag screening, politely ask if it’s OK for the film to be handchecked. Politely present the freezer bag full of film. One of several things could happen here, and one of them being barked at that the scanner is perfectly safe for your film and you’re holding up the line. But you’ve done yourself and the overworked airport staff a favour by making the film as easy to check as possible, out of its containers and in a clear plastic bag. Should they relent this will take them the minimum of time. Pre-preparation is key. It doesn’t take more than 10 minutes to empty your film boxes and canisters and the upshot is you can carry more film because they weigh less and take up less room. And remember the airport staff are trying to do a stressful job as quickly and as painlessly as possible. That they won’t – or can’t – isn’t down to them being jobsworths 99% of the time, and loudly stating your rights can prove more trouble than it’s worth. Personally, I’ve found one of these approaches has worked even at the furiously busy Heathrow. On one trip back home to New Zealand I got my film handchecked at every airport on the way there and every one on the way back bar one internal flight in NZ. I turned up early, I had the film in a freezer bag, and I asked politely. Pro tip: Take a second empty freezer bag, pack that in your toiletries bag in your hold luggage, and then when you’re actually at your destination and shooting film, you have one bag for your unexposed film and another for the rolls you’ve shot. Transfer the exposed rolls into this one every time you’re back in the hotel/Airbnb/houseboat/castle. You want to take a rangefinder for street scenes, medium format for people portraits, an SLR for landscapes and a compact for when you’re travelling light. All this – and its accompanying film – will have to travel in the cabin. But you don’t necessarily want to be lugging it about from day to day. The system that’s worked best for me over the years is two camera bags – one to take the bulk of your gear on the flight and the other for overspill (more on this later). Let’s call them the cabin bag and day bag. On a recent trip to Singapore to Borneo I was able to pack six different cameras along with some with some 40 rolls of film into my cabin bag. My day bag – an old Crumpler Muffin Top bought about a decade ago – goes in the hold luggage, usually with toiletries inside it, or if two-cabin-bag regulations allow it, it’s where I can stow a book, notepad, medication etc and keep at my feet during the flight. The cabin bag is to keep stuff safe and secure in transit. You don’t really want to be dipping in and out of it constantly if it’s in an overhead locker. Yes, it’s great to bring your Hasselblad, Leica M3, Nikon F3 and Contax T2 with you on your trip, but only a masochist will want to take that with them every hour of every day. You’ll likely end up with backache and photo fatigue. And what if it gets stolen – there goes all your gear, and all your film. That’s where the day bag comes in. Load the day bag with enough film and a couple of cameras, with a little bit of space for other stuff you might need out and about (sunblock, book, notepad etc). When you head back to your accommodation you can switch gear. There’s no need to lug 10 rolls of Tri-X around for night shooting if you’re setting out at 6am to photograph the markets. You should always empty your day bag of exposed film when you’re back in your accommodation. Should the worst happen and your day bag is stolen, not everything is lost. Chances are that if you’re travelling, you’re doing it in sunny climes. And if you’re travelling from place to place in hot weather you’re going to have situations where film is going to be kept in less than ideal heat and humidity – like the sweltering luggage hold of a Latin American bus, perhaps. The odd few hours of a luggage rack sauna aren’t likely to do much damage unless you’re pushing Kodak’s P3200 to 12,800 (if you do that, please show me what they look like). It’ll be even less stress on slower 100-ISO consumer negative films, the travelling photographer’s friend. If you don’t want to keep your film in your luggage, away from sight, then keep it in the bag next to you. Make sure you keep it out of direct sunlight. Resist the temptation to get your films out and make notes etc while you’re travelling unless you’re in shade. You’re more likely to drop one and mislay it. All that can wait until the end of the day with a cold drink at your elbow. Is it worth buying local? Another option, if you don’t want to lug 50 rolls of film with you from Point A to Point Z, is to buy film at your destination. There are times when that makes perfect sense. If I’m going to Istanbul, for instance, it makes little sense to spend £4 on a fresh roll of Fomapan 100 at home when I can buy the same thing for £2 in Istanbul. In certain cities with a healthy film scene – Berlin, Istanbul, New York, Brussels, Amsterdam, Singapore, Hong Kong and Tokyo, to name a few off the top of my head – it would make sense to buy film as you need it. But do your research. If you’re an American who loves shooting Kodak films and you’re travelling to Japan, you’re going to be paying more for the film in Tokyo than you will in Los Angeles. If you like shooting on more obscure films – slide, in this day and age, for instance – then take that stuff with you. You don’t want to waste time trying to track it down in an unfamiliar city, and missing out on photography time. Read up photography forums and travel sites to get a sense of which labs are worth buying film in and check their websites for prices. It might be that certain films are cheaper. Do this, of course, before you leave home. One sure fire way to prevent film being fogged by x-rays and heat is to get it developed while you’re travelling. Developed film is impervious to x-rays. The big issue here is finding a lab that you trust. This is obviously a lot easier in the internet age than it might have been 20 years ago. Many of the better labs now have an international following thanks to a lab blog or prominent Instagram accounts. Again, using them may turn out cheaper in some places than getting the films developed at home. Just bear in mind that you’ll be trying a lab for the first time. Everything listed below is also worth taking with you, as long as space permits. Check your gear a week before you’re leaving, and if the batteries are low, replace them. If your batteries still seem to be OK but you know they’ve been in the camera for more than a few months, make sure you pack spares. In many places the only batteries you’re likely to find are AA and AAA – anything more esoteric than that might be more difficult outside in some places. If you’re travelling any bright and sunny and shooting on an SLR, then a polarising filter is an absolute must. Apart from a UV filter, which should already be on the front of every lens you’re taking, this is the first filter you should be taking. It will bring super blues out of clear skies, bring definition to clouds, saturate bright colours, take reflections out of windows and water, and cut through haze. Opt for a circular polariser, which is cheaper. Graduated filters are a must for landscape photography where you have to balance a brighter sky with a darker foreground. They’re less useful for street photography. If you are going to be getting up at the crack of dawn, take them. If not, they’re probably dead weight. If you’re shooting black-and-white film in bright conditions, coloured filters might be worth taking along too. What might be a colourful scene in real life gets reduced to shades of black, grey and white, meaning you might end up with a flatter, less interesting image. Red filter: For the most dramatic effects. This darkens blue skies and makes white clouds really stand out. It also lightens brickwork, revealing texture that you otherwise might miss. The effect is not subtle, and can look similar to an infra-red filter, so it should be used judiciously. Use it for portraits and you’ll render white skin lighter, making blemishes less visible. It’ll also make lips lighter too though. Orange: Less dramatic than red but with a stronger effect than yellow. This also lightens skin and removes blemishes. In landscape, it’ll also mean darker skies, better-defined clouds and less atmospheric haze. Lifts some texture out of stone and brick, too. If you’ve room for only one filter for your black-and-white films, take this one. Yellow: A much more subtle effect than red or orange, the yellow has an effect on clouds but it’s much like dramatic and more likely to match with your foreground. It has a much more subtle effect on skin too, though it’s still noticeably improving. Definitely worth making room for. Green: Lightens the tones in foliage, but much less than an IR filter. The lightening effect can help make flowers stand out from surrounding foliage. It can also have a pleasing effect on skin tone, too. Be aware that it also lightens the sky, reducing some of the contrast. Blue: Want to reduce the amount of tone, add a more ethereal look to shots in hazy or misty conditions? Reach for a blue filter. Useful for those getting up early to snap misty streets and fields, but probably of limited use shooting a bustling market in the afternoon. Filters attract dust and lint like nobody’s business. Keep them in a filter wallet that you can zip up, and sticker the sizes so they’re easier to find. A broken or scratched filter is no use to anyone. Chances are, if you’re shooting film these days, you have more than one camera and enjoy showing off your results online. You might also have a blog. Jotting down notes as you go means you don’t forget some of the interesting little asides that happen outside the photos – as well as keeping track of whether you’ve pushed that roll of Tri-X, cross-processed that old Agfa Precisa or done something else that needs writing down. When you’re travelling, there will be a lot to write down anyway. I swear by the Moleskine reporter style notebooks, partly because they take up so little room in a camera bag (mine usually sites in the front pocket of my day bag), partly because they have a robust-yet-flexible cover that keeps them going strong trio after trip, partly because they have a band that you can slip a pen around, and also because they have a reinforced pocket useful for holding stickers. If you want something even lighter, consider these notebooks made by Mike Padua from ShootFilmCo. Small, white, rectangular stickers that you can put camera, lens, ISO info on and then put on your exposed cassette. The single most effective way to make sure you don’t forget to tell your lab vital information that could be the difference between ruined rolls and breathtaking pics. You don’t need anything fancy, just stickers big enough to be able to write down a few words legibly and small enough to fit on the cassette. Don’t spend a fortune on flouncy fountain pens (where are you going to get a refill in Borneo?) but do buy a handful of decent black or blue pens and find a place to stash them in your bag. Keep one to hand in your day bag. One way to make sure you only take exactly the film you need out each day is to bring a film case. 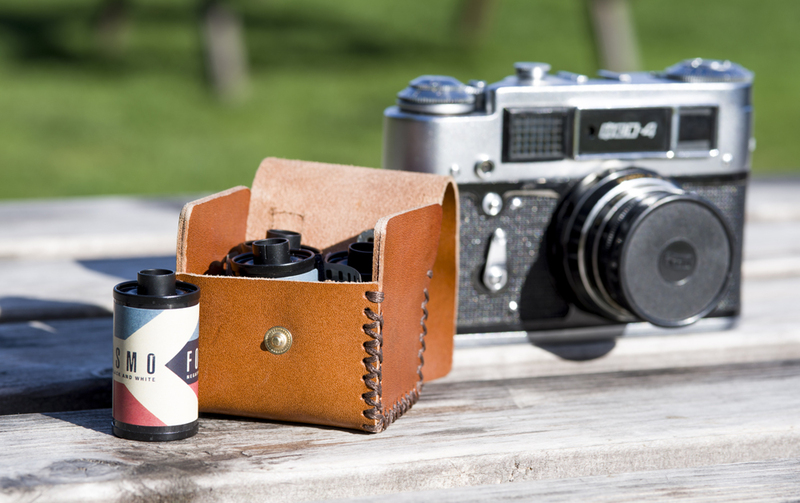 Kosmo Foto has designed this leather one which fits four rolls of 35mm, while Japan Camera Hunter has range of hard plastic cases for both 35mm and 120 film. This will keep your film safe in one place and make sure you’re not carting a big plastic bag full of film around with you all the time. 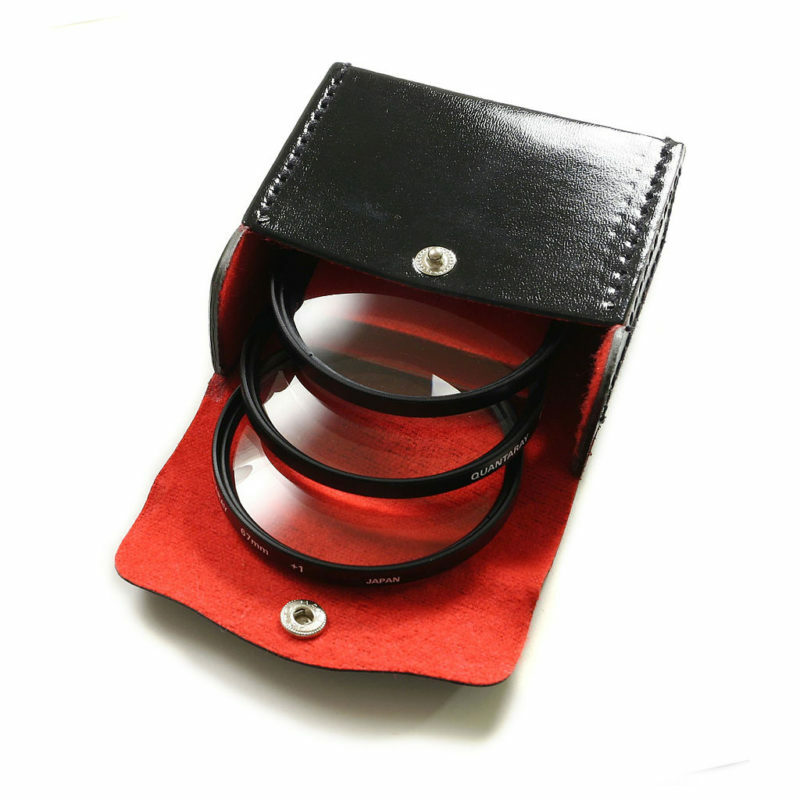 Often, all you are going to need to keep your lens clean is an optical cloth, the same kind of thing you might use to keep glasses clean, and a blower brush, also very cheap, which you can use to blow the worst dust off the surface of the lens. You can pick these up for very little from camera shops or online. Only if your lenses are likely to get a decent amount of dust and grit on them do you need to bother with lens cleaning fluid; camera lens coatings are more likely to be damaged from unnecessary cleaning than a little bit of surface dust. Remember too that any lens cleaning fluid in your carry-on luggage will have to stored in an airline-approved plastic bag, so it might be easier to store it in your hold luggage for the flight. I sometimes have a light meter with me because I’m taking one of my older cameras that doesn’t have a meter. I sometimes take one because the meter’s ISO range is higher than some of my SLRs’. But I always have a small portable meter in the camera bag. My pick is the Sekonic L-208, which is small enough to put in your pocket, easy to use and very reliable. For decades, tens of millions of people travelled wide and far, and captured their memories on film. There’s no reason why, in this digital-focused 21st Century, we can’t capture on travels our film. All it takes is a little planning. Do you have more tips on how to travel with film? Let me know in the comments below! Next articleThe perfect 21st Century film camera? Great article – covers everything in a straightforward, down to earth way. Two comments: (1)you can of course put your cameras – without film – in the hold baggage to save lugging the weight in the cabin. (2) I’ve only ever been through two cruise terminals, but the scanner operators were much less willing to hand inspect a bag of film than any airport I’ve ever been through! Has anyone any experience of the rail terminal scanners for Eurostar or the new Thalys ones? 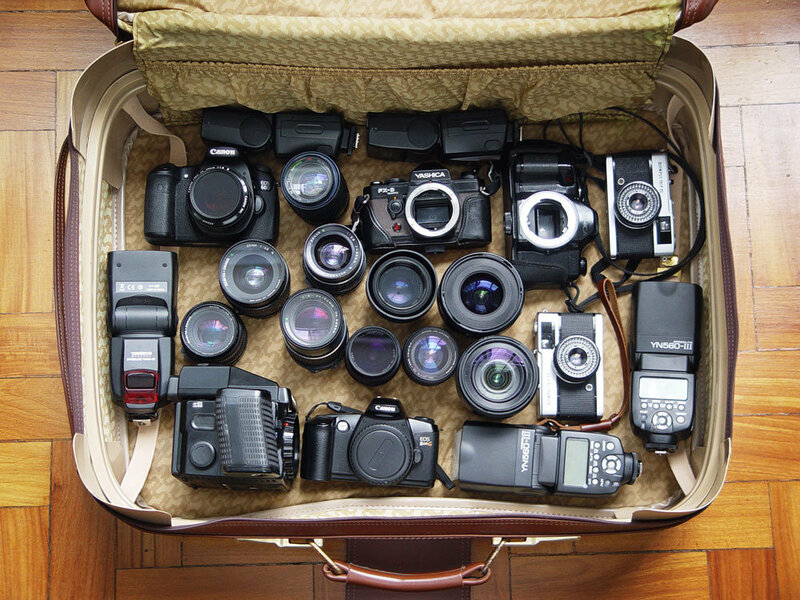 Mike, you should never put your cameras in the hold luggage. That’s just asking for trouble. I did Eurostar last week, no issue with hand inspection in Paris or London. Good to know for the next time I take the train! I once had real difficulty trying to get my Instax (with unused film) bypassed by airport scanners in…Sudbury, Ontario (Canada), even after I pointed out that I was able to do so at Toronto Pearson airport! Luckily, there was no damage. Perhaps the security personnel had difficulty believing that anyone uses film! Never load film into the camera and expect the camera to be hand-checked, they’ll have to either open the camera up or send it through the scanner! What a great article, I wish I had thought of the Ziplock bag idea instead of using my film shield bag when I traveled to Norway a year ago. I’d like to share this on Uncle Jonesy’s Cameras, if that’s ok.
Hi Kevin, thanks very much. Happy for you to share the link but not to republish it. For old times sake, I am considering taking one of my lighter weight cameras on our next ‘bucket-list’ holiday. So the choice is between a Nikon N65 slr with 28-200mm lens, a Pentax P30T with 70-210mm, or a Canonet QL19. Right now, I am leaning towards the Nikon. I am more concerned about weight followed by access to fresh batteries.